Don't forget, winter bodies are made in summer! More The Splat: Nickelodeon Opens Its Vaults to Bring Iconic Properties To Comic-Con International: San Diego 2016! Go behind-the-scenes and check out all the exciting action that happened during the first days of filming Yo Soy Franky 2! Mira todos los detalles que pasó durante los primeros días de grabación de Yo Soy Franky 2! ¡LLEGÓ LA HORA DE VOTAR por los KCA México! Zap2it TV Listings is reporting the exciting news that NickSports, Nicktoons USA's popular sports-themed programming block, will start to premiere and show the brand-new second season of Soccer Superstar, NickSports' reality sports competition series that follows the coast-to-coast search across the U.S. for the next best teen female soccer player, every Friday from 15th July 2016! NickSports will debut two all-new episodes of Soccer Superstar each week (air times to be announced). Season two of Soccer Superstar sees three-time Olympic gold medalist Heather Mitts returns as host, along with an acclaimed panel of judges including National Soccer Hall of Famer Marcelo Balboa, two-time Olympic gold medalist Angela Hucles and youth development expert Dan Metcalfe, scour the country, visiting Dallas in Texas, Tampa in Florida, Denver in Colorado and San Diego in California, looking for the next best teen female soccer player. 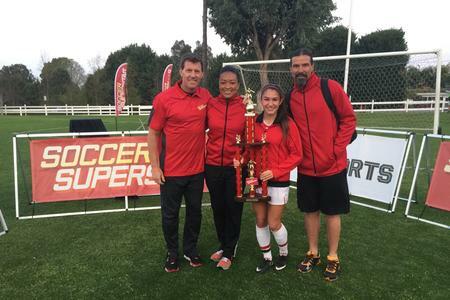 Vanessa Millsaps was crowned the 2015 Soccer Superstar by Marcelo Balboa, Angela Hucles and Dan Metcalfe. "Hosting the first season of Soccer Superstar was an amazing experience, and I was so impressed with the determination and skills of this next generation of female soccer players," said Mitts. "We're raising the bar this season with technique challenges and exciting competitions that will have viewers at the edge of their seats as these girls' abilities are put to the test." Soccer Superstar is produced by Magic Pictures International (My Beautiful Game, Opening Night, Who Are You? Corkscrewed) Bizzy Signals Entertainment (2012 Summer Olympics, 2015 Women's World Cup) and Mint Pictures (Bushwhacked!, Code of Silence and Red Bull Cape Fear),. The series is executive produced by Kristopher Lythgoe, Michael Cohen and Adam Kay. Soccer Superstar is based on the award winning series, Football Superstar, created by Mint Pictures and Foxtel Australia. Production on season two begun in February 2016. NickSports celebrates kids' love for the action and excitement of sports with an all-access pass to their favorite athletes, teams and leagues. Airing every Friday (9-11 p.m. ET/PT) on Nicktoons, the primetime programming block for kids and families features a lineup of original and acquired sports-themed programming including series, specials, movies and documentaries from major professional sports leagues including the NFL, MLS, NASCAR, WWE, MLB and PGA, and professional athletes. The weekly block features long- and short- form content including the NFL RUSH ZONE franchise, the magazine-format show NFL RUSH, NASCAR's Hammer Down, WWE Slam City, EA SPORTS Game Changers, the animated series Wild Grinders from Rob Dyrdek, NFL Flag Championship at the Super Bowl and the critically-acclaimed basketball documentary Little Ballers, as well as fun interviews, parodies and sketches . Fans can follow NickSports on Twitter, Facebook and Instagram - @NickSportsTV #NickSports. Follow NickALive! on Twitter, Tumblr, Google+, via RSS, on Instagram, and/or Facebook for all the latest Nickelodeon, Nicktoons, NickSports and Soccer Superstar News and Highlights! 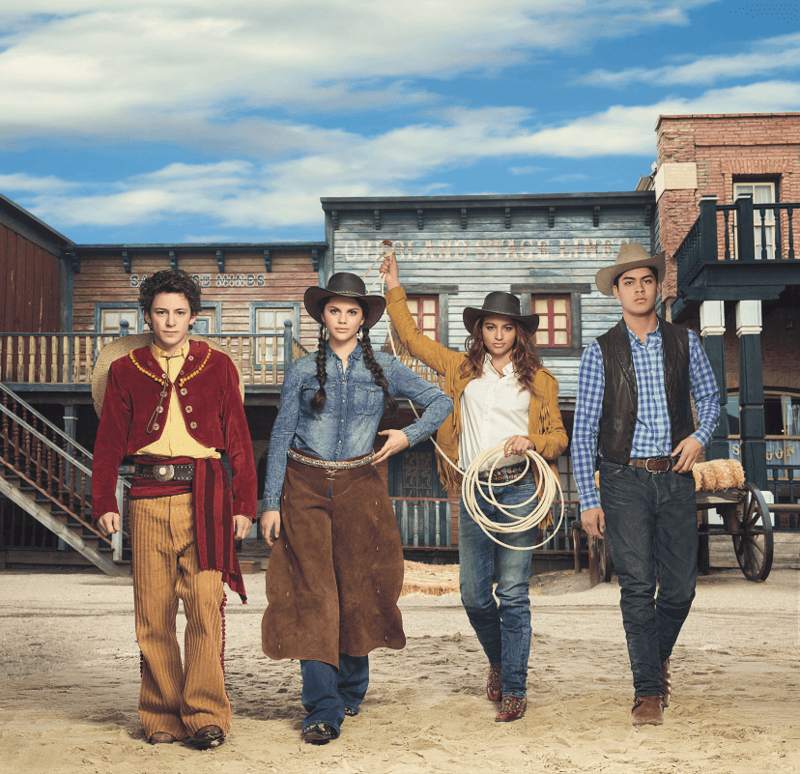 Nickelodeon Northern Europe has announced the exciting news on Nickelodeon Germany's "Nick Pressecenter" that Nickelodeon Germany (Deutschland), Nickelodeon Austria (Österreich) and Nickelodeon Switzerland (Schweiz) will be premiering Lost in the West, Nickelodeon's brand-new three-part original TV movie about two time-traveling stepbrothers who saddle up for a crazy Wild West adventure after they get transported back in time to 1885 when one of them accidentally invents a time machine, in August 2016! Nickelodeon Northern Europe will premiere Lost in the West "Part 1" on Saturday 13th August 2016 at 16:15 Uhr on Nickelodeon Switzerland and at 17:55 Uhr on Nickelodeon Germany and Nickelodeon Austria (encored the following day, Sunday 14th August 2016, at 11:35 Uhr and 13:20 Uhr on Nickelodeon Germany & Nickelodeon Austria and Nickelodeon Switzerland, respectively). 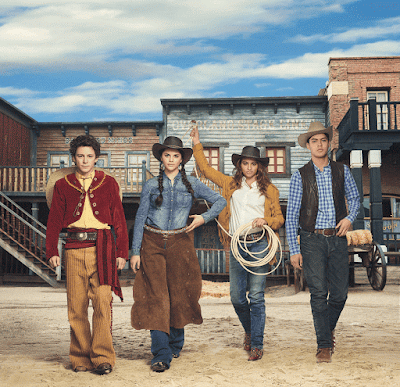 Following the premiere of Lost in the West part one, Nickelodeon North will premiere Lost in the West "Part 2" on Saturday 13th August 2016 at 16:15 Uhr on Nickelodeon Schweiz and at 17:55 Uhr on Nickelodeon Deutschland and Nickelodeon Österreich. Although currently unconfirmed, Nickelodeon Northern Europe is expected to debut Lost in the West "Part 3" on Nick Switzerland and Nick Germany & Austria following Saturday, 27th August 2016, at the same times. Nickelodeon Netherlands (Nederland), Nickelodeon Belgium (België; Flanders), Nickelodeon Denmark (Danmark), Nickelodeon Sweden (Sverige) and Nickelodeon Norway are also expected to premiere Nick's all-new television movie on the same days. Nickelodeon's all-new three-part original TV movie, Lost in the West, centres on polar opposite stepbrothers, Chip, an all-around tech genius who lacks self-confidence, and Dave, a charismatic ladies' man with more brawn than brains. Their otherwise ordinary lives take an extraordinary turn when Chip's latest invention accidently lands them back in time to the Wild West. The duo soon become entangled in a thrilling adventure as they fight off evil outlaws to save their hometown. When their actions in the past have time-altering repercussions, Chip and Dave enlist the help of friends from both time periods, including Luna, Lisa and Texas Jane, to avoid changing the future and make it back to the present in time for their school's Homecoming Dance. Follow NickALive! on Twitter, Tumblr, Google+, via RSS, on Instagram, and/or Facebook for the latest Nickelodeon Northern Europe and Lost in the West News and Highlights! It's a Victorious birthday celebration! In honor of Ariana Grande's 23rd birthday, her former Nickelodeon co-stars joined together to celebrate the starlet! "Crew minus a few // happy birthday Ariiii" castmate Daniella Monet captioned a group shot of the actors on Instagram, including from left to right, Grande, Monet, Matt Bennett, Leon Thomas III and Avan Jogia. Before she ignited the pop music scene, Grande was a star on the hit Nickelodeon comedy series, which followed aspiring musicians and actors at Hollywood Arts High School, until it ended in 2013. Following Victorious, Ariana reprised her role, Cat Valentine, in the iCarly/Victorious spin-off series Sam & Cat, in which she co-starred with Jennette McCurdy, who reprised her iCarly character Sam Puckett. All three shows were created by Nickelodeon hitmaker Dan Schneider. While the "Into You" singer turned one year older on Sunday, the group got together during the week for some late-night fun by the pool. As is mandatory of any star-studded celebration, there was no shortage of swans. "Thing got too cute last night," Bennett captioned an adorable candid shot of he and Grande holding hands while floating atop the swans in the pool. Their silly shenanigans was just what Grande ordered for the occasion. "I will forever ever and ever love these two w all my heart," she wrote of Bennett and Jogia as they sang and sucked helium out of balloons. A few days before Grande's big day, reality star Kylie Jenner gifted the Grammy nominee with her entire lip kit product collection. "Happy early birthday to me," Ariana shared on Snapchat while displaying her surprise gift. "Thank you Kylie. My [lips] bout to be so happy. Love U." However, it seemed no one was happier about the present than Grande's mom. "Just saying KyMajesty was actually made for Joan Grande," the singer said on social media as Joan puckered with the color on. The stars of Victorious previously reunited for a special Christmas onesie party in December last year. 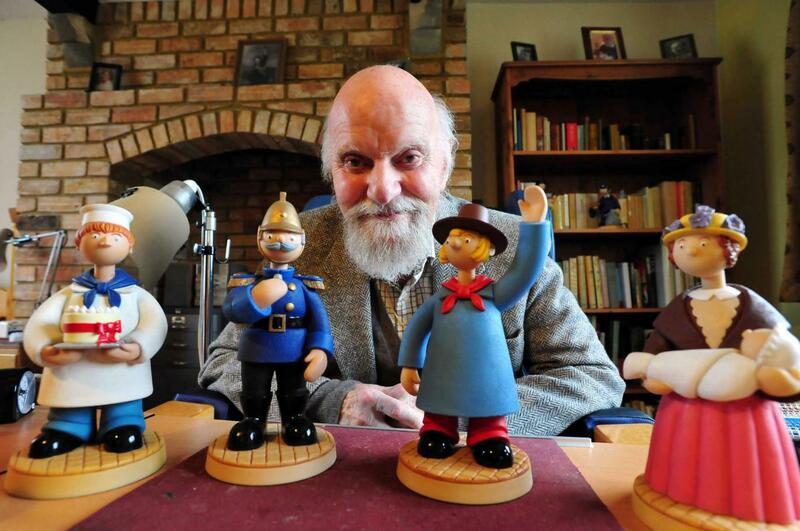 Gordon Murray, creator and puppeteer of the popular BBC children's series Trumpton, has sadly died at the age of 95. His son-in-law, William Mollett, confirmed the news in a statement to the BBC. The producer wrote some of the most popular children's television programmes, including The Trumptonshire Trilogy - with big names Camberwick Green, Trumpton and Chigley - which were shown weekly by the BBC from 1966 for 20 years. The programmes were later repeated by Channel 4 and then Nick Jr. UK, as part of the channels Noggin/Nick Jr. Classics programming block. 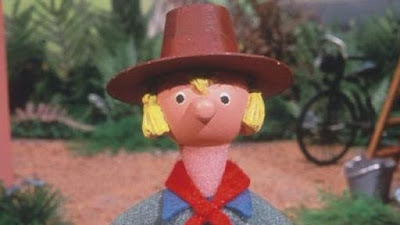 Camberwick Green, which was made using stop-motion animation, was the first children's show to be aired in colour on the BBC in 1966. 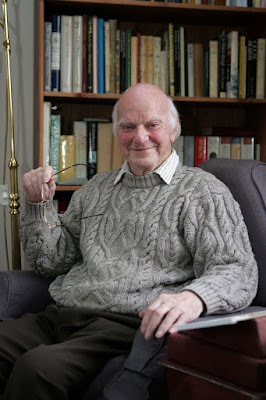 Murray was born in London on 3 May 1921 - the youngest of four children. He attended Emanuel School, where he studied Classics - but later gave up Latin and Greek, after which he spent most of his time in the art and drama departments. Mr. Mollett told the BBC that Murray enjoyed going to the Victoria Palace Theatre with his father as a child to see variety shows - and particularly liked the marionettes. Speaking in 1999, Gordon said: "I have been interested in puppets ever since I was a child. My enthusiasm was greatly stimulated, I remember, by a visit to the Victoria Palace when I was about eight to see Delvain's Marionettes on the variety bill. Later, of course, I avidly read the Whanslaw books." Murray was nine years old when his father died in 1930. After leaving school, he started working as a journalist and joined the Territorial Army. In 1939 he was enlisted in the London Scottish Regiment. Having been commissioned into the Royal Corps of Signals, Murray took part in the Normandy landings as a platoon commander, landing on Gold Beach. 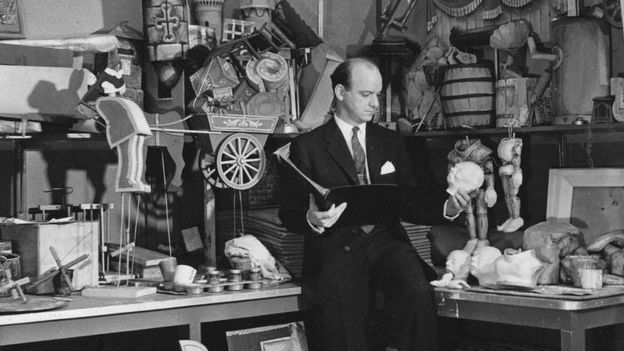 After being demobbed at the end of the Second World War, he set up his own puppet company, Murray's Marionettes, worked as an actor in repertory theatre, and appeared in Shakespeare plays and Peter Pan - where he met his wife, ballet dancer Enid Martin. 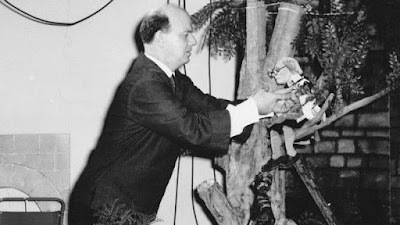 In the 1950s, Murray established a puppet company touring theatres in the UK, when he was scouted by BBC producer Freda Lingstrom. His first television credit was in 1954 as a puppeteer on Bengo - a children's programme about the adventures of a boxer puppy. 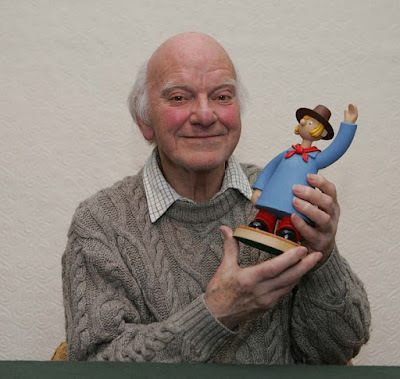 He went on to produce several successful marionette shows for children's television including Sketch Club, Captain Pugwash, and Hans Christian Anderson's The Nightingale. In 1958 he created the series A Rubovian Legend, which ran until 1963, with fellow puppeteers John Hardwick and Bob Bura who he wen ton to work with for years after. After the BBC's Children's Department and Women's Programmes merged in 1964, Murray had the opportunity to become the BBC's head of children's programmes, but chose instead to form his own independent production company, Gordon Murray Puppets Productions, where he created the Trumptonshire trilogy. The model characters were made out of foam latex, with ping-pong balls used for the heads. Photo: Gordon Murray estate. 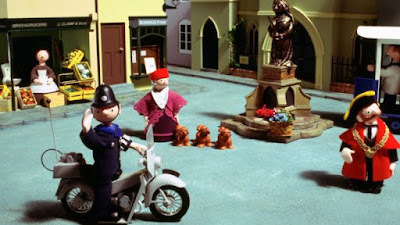 Camberwick Green, Trumpton and Chigley were created using stop motion animation and actual 3D scaled down models. The characters were eight inches tall, with heads made out of ping-pong balls and clothes out of foam latex. There were 39 short episodes across the trilogy - all of which were first broadcast on BBC One, airing before the midday news. The programmes were digitally restored and re-released in 2011, after the original footage was found in the family's attic and in the BBC archives. Murray went on to create television shows Skip and Fluffy, which aired as part of the Multi-Coloured Swap Show in 1978, and The Gublins. He retired from animation in the 1980s and went on to produce 34 limited edition miniature books, bound entirely by hand. 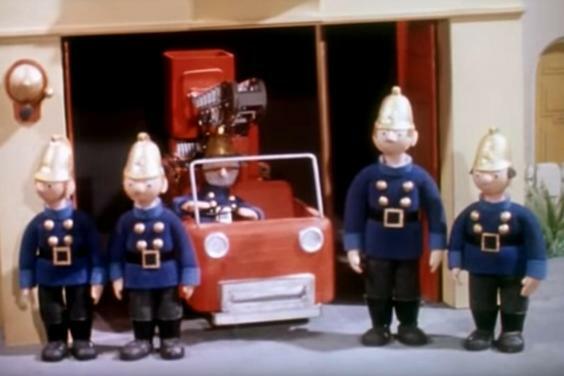 After the Trumptonshire Trilogy ended, Murray decided to burn all of his puppets, except for one soldier from Camberwick Green. In an interview on Radio 4, he said: "I burnt them in a bonfire in my garden. I'd had them for some time after the transmissions had stopped. "And various people had said "oh they're old fashioned", and they always were old fashioned actually. They were old fashioned from the word go. "They had been used an awful lot you know so I burnt them, together with the scenery." He added: "A puppet is an actor you see, and as an actor he only exists as he is performing. After that he's done his job and therefore the actual figure is redundant." Following the news of Murray's passing, tributes begun pouring in, and one fan wrote on Twitter: "Camberwick Green, Trumpton & Chigley creator dies. Thank you Gordon Murray for adding vibrant colour to my childhood." While another added: "Thank you for so many happy memories. RIP Gordon Murray." In recent years he lived with his family near Stamford and is survived by his daughters Emma and Rose and his four grandchildren. Original sources: BBC News, Mirror Online, London Evening Standard. Nicktoons Facts: All Grown Up! was a spinoff based of Rugrats based on the 10th anniversary episode "All Growed Up." It premiered on April 12th, 2003 as the highest-rated premiere in Nickelodeon history (at the time) and ran for 55 episodes over 5 seasons. The theme tune is sung by Cree Summer, who voiced Susie Carmichael on both Rugrats and All Grown Up!. I treat each and every day like a mini vacation! I really wanna shout it out! All Grown Up... with... you! More Nick Animation 25: "Rugrats" Theme Song - Episode Opening Credits - Nickelodeon's 25 Years of Animation Celebration! Catch more Harvey Beaks on Nickelodeon and Nicktoons! Follow NickALive! on Twitter, Tumblr, Google+, via RSS, on Instagram, and/or Facebook for all the latest Nickelodeon UK and Nicky, Ricky, Dicky & Dawn News and Highlights! Harvey Beaks - Tanz mit Harvey. Harvey zeigt uns, wie man tanzt, wenn das Lieblingsbild auf einer Party gespielt wird. Watch more Harvey Beaks on Nickelodeon and Nicktoons! More Nick: Foo Pancake Art - Harvey Beaks - Nickelodeon Deutschland! Catch more Henry Danger on Nickelodeon and TeenNick and watch "Danger & Thunder" now on Nick.com! New series premiered in the US on May 30th on Nick Jr.
Halifax, NS – 14 June 2016 – DHX Brands, the dedicated brand-management and consumer-products arm of DHX Media ("DHX" or the "Company") (NASDAQ: DHXM; TSX: DHX.A, DHX.B), has signed six new North American licensees for its hit preschool property, Teletubbies, in a series of deals brokered by CPLG North America. DHX Media’s new Teletubbies series launched last month on Nick Jr. in the US and is also airing on Family Jr. in Canada. Joining the roster of top-tier licensees on the brand are Hybrid (Apparel), Amscan (Paper and Party Goods), Playtex (Sippy Cups, Bottles, Infant Mealtimes and Pacifiers), Global Brands Group/AME (Sleepwear), Rasta Imposta (Costumes, Novelty hats) and TabTale, the second Teletubbies app partner. These join a line-up of previously announced Teletubbies licensees, including Sony Pictures Home Entertainment (global DVD and Digital), Spin Master (North American Master Toy Distributor), Accessory Innovations (Bags, Backpacks, Hats), SG Company (Footwear), Franco Manufacturing (Juvenile Bedding), Betesh (Toddler Bedding), VTech (Electronic Learning Toys) and Cube Interactive (Apps). To date, more than 65 licensing deals worldwide have been signed for the new Teletubbies. Global phenomenon Teletubbies first launched in March 1997 and became one of the most successful global children’s brands of all time. It has reached more than 1 billion children to date and the original episodes have aired in over 120 territories in 45 different languages. It was the very first western pre-school property to air on China’s CCTV reaching an audience of 300 million children. Its enduring resonance with children is further underscored by the brand’s postings on YouTube which reach over 100 million views per month. DHX Brands is the dedicated brand-management and consumer-products arm of DHX Media Ltd. (NASDAQ: DHXM; TSX: DHX.A, DHX.B) (www.dhxmedia.com), a leading creator, producer, marketer and broadcaster of family entertainment. DHX Brands specializes in creating, building and managing high-profile global entertainment brands within the children’s and young-adult markets. With expertise in brand development, licensing, marketing and creative, we develop brands which captivate and inspire through engaging content, first-class distribution, quality consumer products, immersive live experiences, and digital media. DHX Brands’ world-class portfolio includes Teletubbies, Twirlywoos, In the Night Garden, Yo Gabba Gabba!, Caillou, Make It Pop!, Slugterra, and Degrassi. DHX Brands has offices in London, Toronto and Los Angeles. CPLG (www.cplg.com) is one of the world’s leading entertainment, sport and brand licensing agencies with offices in the UK, Benelux, France, Germany, Italy, Spain, Sweden, Poland, Middle East, Greece & Turkey and the US. Owned by DHX Media (www.dhxmedia.com) a leader in the creation, production and licensing of family entertainment rights, CPLG has more than 40 years of experience in the licensing industry. It provides each of its clients with dedicated licensing and marketing industry professionals and a fully-integrated product development, legal and accounting service. CPLG believes that partnership is about clarity, openness and trust, and is widely known for its no-nonsense, straightforward approach; Expert Common Sense. This press release contains “forward-looking statements” under applicable securities laws with respect to DHX including, without limitation, statements regarding the broadcast, distribution, licensing, growth, and business strategies in respect of Teletubbies. Although the Company believes that the expectations reflected in such forward-looking statements are reasonable, such statements involve risks and uncertainties and are based on information currently available to the Company. Actual results or events may differ materially from those expressed or implied by such forward-looking statements. Factors that could cause actual results or events to differ materially from current expectations, among other things, include risk factors discussed in materials filed with applicable securities regulatory authorities from time to time including matters discussed under "Risk Factors" in the Company's Annual Information Form and annual Management Discussion and Analysis, which also form part of the Company’s annual report on Form 40-F filed with the SEC. These forward-looking statements are made as of the date hereof, and the Company assumes no obligation to update or revise them to reflect new events or circumstances, except as required by law. Follow NickALive! on Twitter, Tumblr, Google+, via RSS, on Instagram, and/or Facebook for the latest Nickelodeon, Nick Jr. and Teletubbies News and Highlights! Meet The Cast Of Power Rangers Dino Super Charge - Claire Blackwelder: What’s Your Favorite? Visit nick.com/legendary for more Legendary Dudas! Kids' Choice Sports is right around the corner! So to help your favorite athletes get ready, Nickelodeon gave them the ultimate tongue-twisters in the Mouthguard Challenge! Think you can do better? Give it a shot! Don't miss Kids' Choice Sports Sunday July 17th, only on Nick USA! Remember to keep voting for your sporting faves at nick.com/sports and on the Nick App! Follow NickALive! on Twitter, Tumblr, Google+, via RSS, on Instagram, and/or Facebook for the latest Nickelodeon Kids' Choice Sports 2016 News and Highlights! The annual Ocean Park Summer Splash is set to immerse the city from 1 July to 28 August in water fun with a galore of exhilarating water-themed attractions, scrumptious dishes and “Get Closer to the Animals” activities. Nickelodeon’s SpongeBob SquarePants and his friends Patrick Star, Squidward Tentacles and Mr. Krabs are visiting from Bikini Bottom to engage with guests and fans from all over the world in the city’s first-ever SpongeBob Water Party. 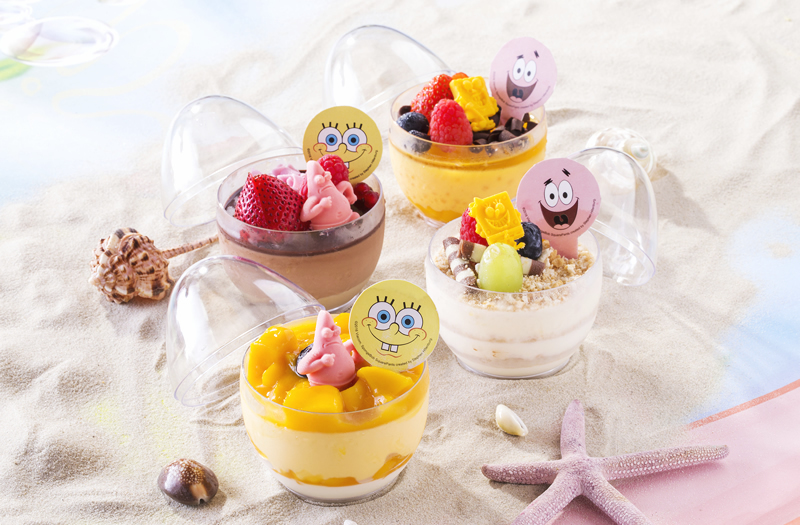 Fans of the adorable character can collect limited-edition souvenirs and enjoy SpongeBob-themed healthy vegetable delicacies and cooling dishes. Ocean Park is also presenting various “Get Closer to the Animals” programmes, including the time-limited summer edition of Grand Aquarium Exploration, which takes guests on a memorable marine adventure. A second wave of summer surprise will start on 15 July, with around 800 prizes being given out every week to guests through the Ocean Park Mobile App. 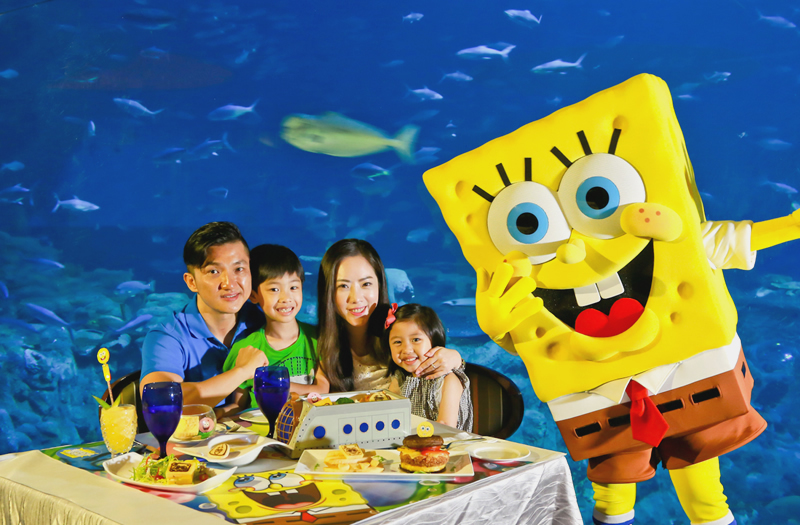 The first-ever SpongeBob Water Party in Hong Kong transports guests into the wondrous world of Bikini Bottom, letting them enjoy a range of immersive water attractions with SpongeBob SquarePants and friends, as well as fun photo and video opportunities for sharing with friends and family. Another major highlight is AMaze-ing Lasers, a brand new ride brought over from the United States for the first time. Players will get the chance to unleash their wits and agility in traversing the laser grids within a pitch dark chamber, as if they were playing an action hero. Each player will receive a score when they press the buttons at different corners of the chamber, making it possible for friends to compete in reaching higher scores. Mega Gush offers the greatest cooling sensation as guests stand below a huge water bucket and feel the incomparable cascading chilling pleasure. 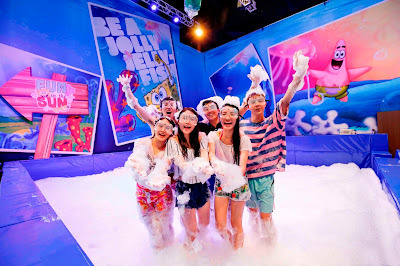 Jumbo Bubble Playground, another brand new attraction, allows guests to create giant human-sized bubbles alongside SpongeBob-themed decorations, making it a colourful photo backdrop. The must-visit Rainbow Fountain cools guests with its fancy waterspouts synchronised to colourful lights and rhythms. Guests of all ages alike will be mesmerised by the strong beats and dynamic lighting at the Wild Foam Zone. Near the Water Party zone, friends can target each other with water bombs at the Super Splash Battle, soaking each other in a fun and festive atmosphere. Kids would want to join the Kids DIY Workshop at Whiskers Harbour to take home their masterpieces such as SpongeBob keychains, Patrick Star catapults, fish and panda dolls made with rainbow-coloured clay. 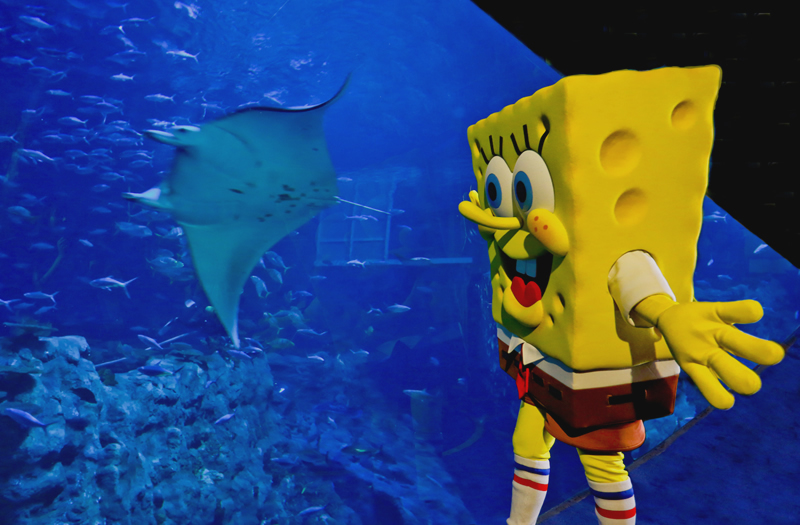 Fans will want to roam the Park to look for SpongeBob and his friends in different summer looks and be prepared for a surprise appearance by SpongeBob who will interact with them. During Summer Splash, guests can visit the limited-time SpongeBob Pop-Up Store near Applause Pavilion to shop for a wide range of limited-edition Ocean Park X SpongeBob SquarePants merchandise, including umbrellas, beach mats, T-shirts and water bottles. Fans looking to spread the fun may take advantage of the face painting service and camouflage themselves as SpongeBob and his friends. 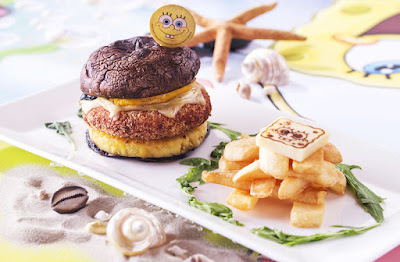 In addition, a series of SpongeBob-themed healthy vegetarian dishes are available at various in-park restaurants and food kiosks featuring decorations of SpongeBob SquarePants. Cooling snacks such as iced pineapple and mini watermelon will also be available at food kiosks to help guests beat the summer heat. Ocean Park is also launching its first-ever Lakeside BBQ Carnival, where guests can savour scrumptious skewers and barbequed food including Grilled U.S. Beef Ribeye Cubes, New Zealand Mussels in White Wine and Herbs, as well as assorted skewers and sausages along with special cool drinks, pushing the party atmosphere to a climax. Water sports enthusiasts would not want to miss the summer-only edition of Ocean Park’s unique snorkelling experience inside the Grand Aquarium. Guests are led by a professional diver to encounter colourful coral and coral fishes, such as Shy Butterflyfish, Painted Triggerfish, Blue-stripped Snapper, fusilier and angelfish. The adventure also includes an exclusive tour of the coral breeding room and back-of-house facilities. Participants can learn about how the Park provides the most suitable environment for corals, thereby deepening their knowledge about protecting corals and marine life while raising awareness of the importance of marine conservation. Participants should be aged 10 or above (children under 12 need to be accompanied by a paying adult to join the programme), non-swimmers are also welcome. A two-person discount is available for this summer edition offered during the Summer Splash period. Guests can register online at the Ocean Park website. Starting on 15 July, Ocean Park is giving away a wonderful array of prizes to in-Park guests through its app (To receive the prize-giveaway notifications and dining coupons, guests must connect their mobile device to Ocean Park’s official Wi-Fi network). “Surprise e-Coupons” will be given out at 11:30am and 1pm on each event day. The first specified number of guests to hit the “Get” button will win prizes such as: a complimentary ticket for joining “Summer Edition Grand Aquarium Exploration”, a Halloween Fest Premium Ticket, Ocean FasTrack, a complimentary ticket for joining “Sea Lion Feeding” or “Shark & Ray Feeding”, in-park dining and shopping coupons, etc. Guests can also receive dining coupons upon visiting five designated COOL attractions, namely “SpongeBob Water Party”, “The Rapids”, “Raging River”, “Shark Mystique” and “Marine Mammal Breeding and Research Centre”. During the Summer Splash period, guests can enjoy the “Ocean Park App’s New User” offer on their purchase of admission tickets with 10% off through the Ocean Park website. Guests only need to present a mobile device with the app, along with the E-ticket, at the entrance to enjoy a joyful and memorable experience at the Park. From 1 July to 28 August 2016, Ocean Park will be debuting an exciting collaboration with Nickelodeon's all-time favourite classic cartoon character, SpongeBob SquarePants, and his friends Patrick Star, Squidward Tentacles and Mr. Krabs, who have come all the way from Bikini Bottom to throw a wet and cool summer party with guests at the Park during this year's Summer Splash! Take photos over mealtime at our SpongeBob-decorated restaurants, and taste SpongeBob-inspired dishes and desserts! The SpongeBob SquarePants Underwater Adventure Menu (set menu) comes with themed souvenirs, while the SpongeBob SquarePants Summer Fiesta Menu (set menu) and Pineapple House (special drink) come with a limited edition LED stirrer! Eating on-the-go? Get the Crispy Bucket at food kiosks! Celebrities Matt Yeung and Lisa Ch'ng will introduce the SpongeBob Water Party! Watch "Teenage Mutant Ninja Turtles" Special "Trans-Dimensional Turtles" In Full And In Russian! LOS ANGELES—June 28, 2016— Nickelodeon and The Splat–the network's programming block dedicated to Nick's legendary library of hits from the '90s and 2000s–are blasting open the vaults for a slime-tastic, immersive experience at Comic-Con International: San Diego 2016 that's bound to be All That, and more. Headquartered at its 1,800 square-foot booth (#4113) on the convention floor, Nickelodeon will pay tribute to some of its most memorable shows and popular characters with activations, games, panels, talent signings and interactive design elements featuring: Legends of the Hidden Temple, Hey Arnold!, Rugrats, Double Dare, Aaahh!!! Real Monsters, CatDog, Rocko's Modern Life, and Invader Zim, among many others. "Those who dare to pass through the sacred gates of Comic-Con will enter a world of nostalgic treasures, artifacts and trivia from Nickelodeon's beloved '90s archives," said King Olmec, Keeper of Nickelodeon's booth. "The choice to enter is yours and yours alone, loyal fans." Every day of the convention, Nick's booth will feature: a virtual reality 360-experience where fans can step into the world of the upcoming Legends of the Hidden Temple live-action TV movie; an interactive trivia game featuring Legends of the Hidden Temple's King Olmec, Keeper of the Temple; photo opps with a life-size replica of the Hey Arnold! stoop and the nose from Double Dare; a retail area, where attendees can purchase a variety of exclusive Nick, The Splat and '90s-themed gear and one-of-a-kind collectibles; costumed character appearances; and autograph signings with cast member from All That, SpongeBob SquarePants' Tom Kenny, Teenage Mutant Ninja Turtles voice talent, Kirk Fogg from Legends of the Hidden Temple, and more special appearances to be announced in the coming weeks. Nickelodeon will present four panels during the convention: Happy Happy! Joy Joy!, a look back at 25 years of original Nick animation featuring the creators of Invader Zim, Hey Arnold! and other legendary series; Teenage Mutant Ninja Turtles–Return to New York, an exclusive first look at the current TV season; She Made That? : Nickelodeon hosts Women in Animation, featuring some of the genre's female pioneers of the past and present; and a special reunion of cast members from legendary kids' sketch-comedy series All That–with a surprise from Nick's forthcoming Legends of the Hidden Temple TV movie. Thursday, July 21, 11:15 a.m.-12:15 p.m. (Room: 6A) – For 25 years Nickelodeon has produced some of the most innovative and memorable animation in the history of television. Nick Animation Podcast host Hector Navarro finds out how and why four of the network's most influential creators did what they did: Craig Bartlett (Hey Arnold! ), Jhonen Vasquez (Invader Zim), Butch Hartman (The Fairly OddParents, Danny Phantom) and Arlene Klasky, who along with Gabor Csupo and Paul Germain, created Rugrats. Don't miss the chance to see production art from the upcoming TV movie Hey Arnold! : The Jungle Movie; animation from Hartman's new Bunsen is a Beast! ; and the world premiere of Don vs Raph, a TMNT animated short written and produced by Jhonen Vasquez. Friday, July 22, 11:45 a.m.-12:45 p.m. (Room: 6A) – They travelled time and space to save planet Earth, and now the Teenage Mutant Ninja Turtles return home! Executive producers Ciro Nieli and Brandon Auman share sneak peeks of the epic adventures and new characters that await the Turtles when they return to the streets of NY in season four. On hand will be the extraordinary voice actors of the TMNT world: Rob Paulsen (Donatello), Greg Cipes (Michelangelo), Gwendoline Yeo (Shinigami) and Eric Bauza (Tiger Claw). Also, witness the world premiere of two never-before-seen TMNT animated shorts presented by TMNT co-creator, Kevin Eastman. The panel will be moderated by Andre Meadows (Black Nerd Comedy). Friday, July 22, 6:30 p.m.-7:30 p.m. (Room: 24ABC) – Join this group of innovative and pioneering female cartoon creators for a discussion on their careers and the opportunities for women in animation today. Panelists include women responsible for the original Nicktoons from the 1990s and others who are making some of today's best animation for TV and the web. The panel will include Lauren Faust (My Little Pony: Friendship Is Magic), Mary Harrington (Invader Zim, Hey Arnold! ), Vanessa Coffey (The Ren & Stimpy Show, Rugrats), Rikke Asbjoern (Pinky Malinky), Margaret Dean (Women in Animation) and Maija Burnett (California Institute of the Arts). 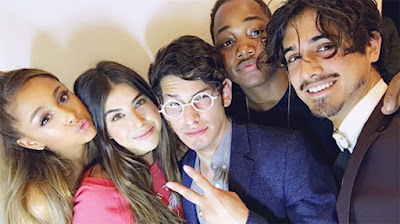 * Back to the '90s: Nickelodeon's All That Reunion and Legends of the Hidden Temple! Saturday, July 23, 11:15 a.m.-12:15 p.m. (Room: 6A) – Join Nickelodeon's throwback programming block, The Splat, for a reunion of the trailblazing sketch comedy series' major players, Josh Server, Danny Tamberelli, Lori Beth Denberg and Kel Mitchell, discussing all things All That, with a few added surprises. Plus, get the first look at Nick's new TV movie based on Legends of the Hidden Temple and hear about it from returning cast members Kirk Fogg and Dee Bradley Baker, along with Isabela Moner (Transformers 5). The panel will be moderated by Entertainment Weekly staff writer, Marc Snetiker. * Legends of the Hidden Temple Virtual Reality 360-Degree Experience: This 360-degree experience transports fans into the world of the upcoming action-adventure TV movie inspired by the iconic game show, allowing them to experience the mysterious Mayan temple first-hand. * Olmec Photo Opp/Trivia: Fans can interact with Legends of the Hidden Temple's King Olmec and test their knowledge by answering trivia questions for the opportunity to win prizes. * Hey Arnold! Stoop and Double Dare Nose Photo Opps: Fans can take photos on a replica of Arnold's stoop from Hey Arnold! and with the nose from Double Dare (beware of boogers). * Autograph Signings: Signing opportunities with Nickelodeon talent include: All That cast; Legends of the Hidden Temple cast; SpongeBob SquarePants voice talent; Teenage Mutant Ninja Turtles voice talent and executive producers; Nick current series creators and executive producers (C.H. Greenblatt, Harvey Beaks; Chris Savino, The Loud House; and Dave Cooper, Johnny Ryan, and David Sacks, Pig Goat Banana Cricket); and Nick original animation creators (Butch Hartman, The Fairly OddParents and Bunsen is a Beast! ; Craig Bartlett, Hey Arnold! ; Arlene Klasky, Rugrats, Wild Thornberrys, Rocket Power; and Jhonen Vasquez, Invader Zim). * Costumed-Character Appearances: The Teenage Mutant Ninja Turtles, Rugrats, SpongeBob SquarePants, The Fairly OddParents, Arnold and Saban's Mighty Morphin Power Rangers and Power Rangers Dino Super Charge will make appearances at Nick's booth at select times during the convention. * Retail: Attendees can purchase Comic-Con exclusive figures, t-shirts and more. * Giveaways: Enter for a chance to win special prizes over the course of the convention. Additionally, in celebration of the Aug. 11, 25-year anniversary of the launch of the network's original animated series (The Ren & Stimpy Show, Rugrats and Doug), The Splat will feature brand-new commentary and behind-the-scenes information from the series' voice talent and creators, along with themed programming and encore airings of these animated series every night during the month of August. Nickelodeon's The Splat is a multiple-screen destination spanning television, eight social media platforms and a dedicated web site aggregating the most loved Nick content from the 1990s and beyond. Celebrating the characters and shows that are definitional to millennials who grew up in the '90s, The Splat consists of: an eight-hour television block airing daily from 10 p.m.–6 a.m. (ET/PT) featuring landmark Nickelodeon programs and classic programming stunts; a fan-driven website (www.TheSplat.com) built around social conversations; a robust social media community on Facebook, Instagram, Pinterest, Snapchat, Tumblr, Twitter, Vine and YouTube platforms; and a fully integrated Splat-branded emoji keyboard with emoticons, stickers and GIFs. Get an exclusive first look at Jakks' lines of action figures, collectibles, and RCs from the company's design and marketing team. Get product development insights and exclusive previews of the JAKKS BIG-FIGS across licenses such as Star Wars, DC, TMNT, and more, and get the latest updates on the whole World of Nintendo line. Following the presentation is a fan Q&A session and prizes for attendees! "Breaking into comics" panels are among the most popular panels at comic conventions throughout the country. Aspiring writers and artists are as in-demand with publishers as social media wizards and Excel-loving number crunchers. Listen to the origin stories of Jim Zub (Wayward, Thunderbolts), Felipe Smith (Mighty Morphin Power Rangers, All-New Ghost Rider), Caitlin Kittredge (Lucas Stand, Coffin Hill), Dan Mora (Klaus, Hexed), and Kyle Higgins (Mighty Morphin Power Rangers, C.O.W.L. ), and the behind-the-scenes professionals they work with to make the comics you love to read! Moderated by BOOM! Studios editor-in-chief Matt Gagnon and editor Dafna Pleban. Learn from this group of veteran female artists working in film/live action, TV, animation, commercials, and toy industries. There will be new announcements of current projects and how you can get involved. They will bring an exclusive look into their work, including displayed props, puppets, and works in progress, and discuss how to maintain a successful career while staying creatively fulfilled. Danelle Vierkant (designer/builder, The Revenant, Comedy Bang Bang), Ivonne Escoto (designer/builder,Tron Legacy, Alien vs Predator, The Creature Shop Challenge), Denise "Dee" Chavez (background designer, Nickelodeon's Sanjay and Craig), Melissa Doss Diwa (designer/builder, The Creature Shop Challenge), Kristin Donner (painter/illustrator, Nickelodeon's The Fairly Odd Parents), and moderator Christine Papalexis (fabricator, Team America: World Police, Alien Resurrection), with special panelist Tracy Black (curator, Unlocking Wonderland and The White Rabbit Project). The story of Aang and Korra has ended in one form but continues in graphic novels and through the fans. Moderated by Avatar_Mom, the panel showcases fan talent and conversations with a panel of professionals from the series. Giancarlo Volpe (director, Avatar the Last Airbender, producer,Green Lantern the Animated Series), Aaron Ehasz (head writer, Avatar the Last Airbender), and Jack DeSena (voice actor, Sokka) share stories and marvel with the fandom. The panel also hosts a cosplay contest open to all levels of skill. Hopefuls must be in the panel room to be considered. Inter-company crossovers are all the rage now, and DC is enjoying a lot of success teaming with other companies on Batman/TMNT, Lumberjanes/Gotham Academy, Batman'66 Meets Steed & Mrs. Peel, and the upcoming ThunderCats/He-Man. Meet the DC talent for these incredible collaborations. We also have BOOM! Studios editor Dafna Pleban, who edits the Lumberjanes/Gotham Academy series and writers for ThunderCats/He-Man, Rob David & Lloyd Goldfine. Join us for more details on these new crossover classics and hints of things to come. Panelists include R. A. Rayne, Kris Koller, Travis Jones, Sebastian Gordlis, and Ethan Benjamin. Nerdibles spotlights Emmy-nominated voiceover actor Eric Bauza (Teenage Mutant Ninja Turtles, Puss 'n Boots). Learn about the art and business of voice acting. Come test out your voiceover talent and perform a script with a real voiceover actor. Love reading compelling, forward-thinking comics? Interested in finding out how multiple-award-winning top 10 publisher BOOM! Studios has spent over a decade committed to telling great stories and nurturing talent? Moderator Filip Sablik (BOOM! president of publishing & marketing) discusses with Matt Gagnon (BOOM! Studios editor-in-chief), Shannon Watters (BOOM! Studios editor), and creators Chynna Clugston Flores (Lumberjanes/Gotham Academy), Hope Larson (Goldie Vance), Kyle Higgins (Mighty Morphin Power Rangers), Simon Spurrier (Weavers), Jeff Stokely (The Spire), and Dan Mora (Klaus) how they explore the ever-changing comics landscape, their newest stories, and the types of projects needed in the industry. As they blaze toward the longest-running TMNT comic ever, come chat with the creators about the ongoing comic, the new universe ongoing, the first-ever TMNT boardgame, past and future crossovers, and more! Featuring the ongoing TMNT brain trust of Tom Waltz, Kevin Eastman, Bobby Curnow, and Mateus Santoluoco, plus Freddie Williams III, Nick Pitarra, and others. This program will focus on the profession of storyboarding in animation for TV and features as well as for live action and how those that work in the field are finding their voices in comics and graphic novels-and visa versa. Moderated by Jim Higgins (former DC Comics editor, comic arts professor), panelists are Peter Paul (storyboard artist at Warner Bros., Dreamworks, Disney, comic artist, instructor), Johane Matte (animator, storyboard artist, comic artist), Steve Ahn (storyboards on Legends of Korra, comic artist), Shannon Denton (storyboard artist, writer, comics artist), Fran Krause (professor, animator, comics artist), and Dan Panosian (professional comics artist and storyboard artist). Meet the team behind Miraculous Ladybug, Jeremy Zag (producer), Thomas Astruc (creator), André Lake Mayer, and Kevin Marciano, English voice cast and director including: Cristina Vee (voice of Ladybug/Marinette), Bryce Papenbrook (voice of Adrien/Cat Noir), Keith Silverstein (Hawk Moth, Gabriel Agreste), Mela Lee (Tikki/Stormy Weather), Max Mittelman (Plagg), Carrie Keranen (Alya/Lady WiFi), Christopher Smith (Tom/Dad/Roger/Roger Cop), Ezra Weiss (voice director), and others as they answer questions about season 1, and where they are headed in season 2. Come dressed as your favorite Miraculous character and you will receive a Ladybug action figure. See previews, win prizes, and join the fun in room 6DE! It's been one year since the premiere of the Invader ZIM comic books based on the popular Nickelodeon series, so be on hand for a retrospective of the series so far as well as hints for what's to come. Featuring Jhonen Vasquez (series creator, control brain), Eric Trueheart (TV and comic series writer), Aaron Alexovich (character designer, artist), Dave Crosland (comic artist), and Megan Lawton (inker) all tell horrible, horrible secrets about the comic book series. Bryan Seaton (Action Lab CEO/publisher) and Dave Dwonch (Action Lab president, Vamplets) host creators Mia Goodwin (Tomboy, Princeless), Thomas Astruc (Miraculous: Tales of Ladybug & Cat Noir), Shawn Gabborin (Puppet Master, Fracture), and many more as they discuss what it takes to make thought-provoking, relevant comics in today's world, as well as adapting the worldwide hit series Miraculous from screen to print. Each year, time is set aside to talk about Comic-Con's first superstar guest and the man they call The King of the Comics, Jack Kirby. Jack left us in 1994 but his influence on comics, film, and this convention has never been greater. Discussing the man and his work this year are Kevin Eastman (Teenage Mutant Ninja Turtles), Kirby biographer Ray Wyman, Jr., Scott Dunbier (director of special projects, IDW Publishing), and attorney Paul S. Levine. Naturally, it's moderated by former Kirby assistant Mark Evanier. From My Little Pony to Strawberry Shortcake, and Skylanders to TMNT Animated and X-Files: Origins to Disney, IDW loves kids' comics and love even more the kids who read them! Hear from the writers and editors of their all-ages fare and then stay for the best Q&A at SDCC since every question is open only to nonadults! Hosted by editors Sarah Gaydos and Bobby Curnow, with Derek Charm, Jake Goldman, and Haley Mancini (Powerpuff Girls), Jodie Houser (X-Files: Origins), Caleb Goellner (TMNT: Animated), Sara Richard (MLP), and Tony Fleece (MLP). Plus prizes for all kids in attendance! Celebrate Nickelodeon's Avatar: The Last Airbender with the brilliant mind of Eisner winner Gene Yang, along with guests panelists. They'll discussing story lines and tease the future in a panel full of surprises and behind-the-scenes stories. Have I missed anything? Let me know on Twitter, Tumblr, Google+, Instagram, and/or Facebook! How to... – Bastel’ einen Patrick Star!. Lernt mit diesem DIY, wie man einen Patrick Star bastelt!